I’m a fan of Matt Colville and MCDM. While I don’t always agree with Colville on everything he says, he usually has well articulated reasons for saying it. Naturally, when the “Strongholds & Followers” (S&F) project was announced, I backed it. The Heroes in my Monday night DnD5e game are hitting the end of the “Chapter” for the story, and have arrived at this game’s version of the “Battle of Helm’s Deep”. In our game, this is the “Battle for Ravenskull Valley”. I decided that we’d use the S&F “Warfare” rules to manage the battle. The players are responsible for managing the two “Allied” factions, and myself (GM) and a guest player are handling the Villian faction. In story, the Clanhold of the Ravenskull Elves is under attack by the fearsome “Sundered Mountain Legion” of Hobgoblins, under the leadership of “Gormakash, the Reaver”. The Heroes, via shuttle diplomacy, have convinced the neighbouring Castle-City of Crierton to honour a decades-old treaty, and send forces to the defence of their old allies, the Ravenskull. The young Regent of Crierton decides to throw the kitchen sink at the modest force of Hobgoblins, estimated to be 400 in number to utterly crush them. His hope is to send a warning to the rest of the Legion to take their forces elsewhere for easier prey. 1200 troops march out of the Caste-City’s gates, heading towards Ravenskull Valley. Unfortunately, when the Crierton Army arrives along with the Heroes, they find that the Legion has also bolstered its forces. Instead of 3:1 odds, the Heroes and Allies now face a nearly equally capable force in the form of the bulk of the entire Legion Expedition. From a Meta-Game perspective, the players have been told that this is a “Historical Nexus”. The literal course of history in the game setting is at stake here. Crierton army may opt to retreat if they lose more than 1/2 their units cards. 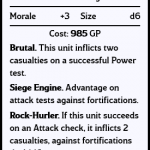 Ravenskull “Infantry” units cannot engage or be engaged by other units until the Ravenskull “Gatehouse” falls (Size 0) (reserve defense; spells in the halls, swords in the throne room, blood on the walls). Player Party can declare a “reaction” / “interrupt” of a Hobgoblin unit attack vs an Allied unit, forcing an Encounter Battle. The Regent, the Matriarch and the Reaver are all historical figures. Any of them dying bends history. Further, losses to the Crierton Army are only replaced in game over time via the S&F rules. In other words, if anything happens in game that needs the Crierton Army for anything else, lost forces may not be replaced in time to meet the new threat. By straight math, the Legion has about a 10% advantage in this battle by unit values. In other words, if this battle had “average” dice outcomes and no “outside interference”, the Legion would defeat the Allies. The most likely outcome is the Crierton Army being forced from the field, and the Ravenskull forces wiped out. Naturally, thus, the job of the Heroes is to bend this outcome. As such, after the first round of combat, they can use a “Reaction” to “interrupt” an attack by a Legion unit on an Allied unit. That fight is fought between the Heroes and the Legion unit as an “Encounter battle”, using standard DnD5e combat rules. After the Heroes use their first Reaction, The Reaver is activated. In any subsequent Reaction / Interrupt, Lord Gormakash can “Counter React” and intercept the Heroes. That battle must be fought before the Heroes can then battle the Legion unit originally targeted to be interrupted. This evening, after the Ravenskull Gate was partially destroyed in last session’s game by Siege Giants, the Heroes have opted to interrupt the pending next attack by the Giants upon the Gate. We’ll see how that goes and what effects it has on the battle. I made the conscious decision to not use the S&FW rule to “merge” similar units together into a larger size class unit. Mostly, because it felt weird and at first glance breaks the economics of the unit purchasing system. I’m a war gamer from Way Back Then(™), used to playing games like Star Fleet Battles and Battletech in the pen-and-paper form. “Unit Cost” is sacred as a balancing tool. However, as you can probably see from the cover graphic to this article, it does make one hell of a mess. The units to the right are Legion, the left hand are Crierton, and the bottom are the Ravenskull. “That’s a lot of units”. On the other hand. When I “revealed” the scale of the Sundered Mountain Legion, the Players were swallowing nervously. All of them know the S&FW rules well enough to know that you have to destroy every Hobgoblin unit; they cannot be routed from the field. We’re fighting this battle using Roll20, with a custom game time created by the community. To that, I’ve added a set of macros that allow game play to be “click attacker, click macro, click target, assign damage if required”. So, we manage about 30 minutes to a round of S&FW battle. The Players have the Sword of Damocles hanging over them, in the form of The Reaver. If they tamper too much with the outcome of the battle, they’ll have to face him at a time and condition of his choosing. On the other hand, they sworn to protect the Ravenskull, most of whom are in fact are non-combatants, from destruction at the hands and axes of the Legion. Feedback after the end of the first session was positive. It feels good, it moves quickly enough even at this scale, the players have two levels of agency, and everyone is invested in the outcome. I’ll report back here as we do more. Let me know what your experiences with S&FW are in the comments below. I look forward to hearing your comments about this article and your own battles! This entry was posted in Dungeons & Dragons 5e, Role-Playing Games and tagged DnD5e, MCDM by MichelV69. Bookmark the permalink.